One of the most important practices of permaculture gardens in the Northeast is mulching. Modern home landscapes create an artificial environment that differs from the native forest environment of many ornamental plants we use. 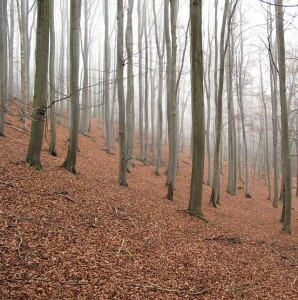 Mulching recreates the forest floor scattered with leaf debris and decaying plant material that trees, shrubs and flowers depend on for nutrients. Even flowers that are naturally found in meadows depend on this process as the dying back of last year’s growth creates a mat of organic material that breaks down over the course of the following years. This is why mulch is important. Not all mulch is equally though. There are a couple pieces of information that you need to know about mulch. Mulch needs to be applied every year. In order to keep weeds from taking over your landscape without the use of chemicals, mulch has to be used. A mulch application in the spring will smother approximately 75% of the weeds that want to germinate in your beds. In addition, the plants benefit from a steady supply of nitrogen later in the year once the mulch starts to break down. This also means that as the mulch breaks down, you are enriching your soil consistently and slowly, without harsh chemicals. Apply 1-2 inches at least, ALWAYS. This is the only way you can ensure that 75% reduction in weeds. Painting the surface with a thin film of mulch will not give you the results you want. As the next bullet point will explain you want to limit the mulch at the bases of woody shrubs and trees so tapper your application immediately around the base of each shrub and tree. But if there is a wide area with no plantings or it is a new bed, 3 inches is recommended. Keep mulch away from the trunks of trees and the bases of your woody shrubs. There is no better way to kill your tree than to bury it with mulch. Yet I cannot tell you how many times I have found trees with crowns buried sometimes up to two feet below the surface of the mulch. What makes it so insidious is this practice will not kill the tree immediately. Slowly over the course of 5 to 7 years the tree will decline until it passes the point of no return even though it may hold onto a few green leaves for another year or two. This leaves people scratching their heads wondering why the tree is sick, when it looked ok last year. Never bury the crown of trees in mulch. The crown is located where the root system flares out into the ground. In fact, many trees have a noticeable change in bark texture when transitioning from the trunk to the roots. This transition should not be buried. In fact a tree can live a very healthy long life with exposed and eroded roots; but is doomed to 7 years if you bury the crown. As far as woody shrubs, the same applies to them. They do not want to be smothered. The delicate hair like feeder roots of the plant, often lie in the first 4 inches of soil. In addition to nutrients and water, they need oxygen to be healthy. Not all mulches are the same. There are at least 10 types of mulches that I have used in Connecticut and each mulch vendor has their own take on these varieties. Here is a breakdown of some pros and cons of each. Hardwood Shredded Bark Mulch Pros– Several mulches fit in this category, so it may come down to budget. Hardwood mulches may be mixed with compost or are tub ground so they break down quickly and thus provide nutrients quickly. Hardwood is consistent in size and texture, and retains soil moisture well. Hardwood Shredded Bark Mulch Cons– Some of the varieties of hard wood mulches can be expensive. Because they are a natural product free of dyes, the color can fade by summers end and either you are ok with that or you will need a very light touch up. Even though they break down quickly and get nutrients into the soil quickly, in the first couple of months, the fresh mulch will actually be drawing nitrogen out of the soil to kick off the decomposition process. So a high nitrogen organic fertilizer or compost should be used when first applied in the spring. Cedar Mulch Pro– Cedar mulches are very aromatic and keep away certain pests that don’t like the cedar smell. The mulch after a month or two and a few rains will form an almost carpet like mat, keeping weeds at bay better than other mulches. 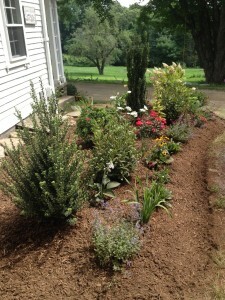 Cedar Mulch Cons- Cedar mulches are often the most expensive of all the mulches. Its strengths may very well be it weakness. The carpet like matt that forms is also very good at repelling water as well. Rain may just run off instead of soak it. Also that carpet like mat that forms is easily disrupted with one footstep or paw print. I have often seen weeds growing in the shape of a footprint in cedar mulch. Often weeds will congregate around spots that are not matted such as the bases of plants where the mulch is thin. Finally, cedar mulch will change color the most. It may be a golden brown in the spring, but it almost invariable is a silver grey by fall. Even dyed cedars fade extensively. Pine Mulch Blend Pros- Pine blend pros are much like Hardwood for same reasons. Reasonable pricing, better color staying power, and consistent texture make it a favorite. Plus, if you have rhododendrons or azaleas, the extra shot of acid will make them love you for a fresh layer of pine mulch or pine straw mulch. Pine mulch Cons – While pine mulch does not attract termites or other pests as a food source, it does provide a better environment for termites to set up camp. But then again all mulches do this. Pine just seems to allow the termites and other pests to live a few weeks longer. This picture shows the base material of dyed mulches before the Dyeing Process. Dyed Mulch Pro – I would be lying if I said I wasn’t biased on this matter. I don’t care for dyed mulch. Although the dyes are vegetable based food dyes, I still don’t like the unnatural colors they come in. However this is the pros section so let me run down the list. The color has amazing staying power, lasting for up to a year to a year and a half. It can form a dense mat when applied correctly, keeping weeds at bay, even persistent ones. It has good water absorption and retention power. In other words it allows rainwater in and keeps it in the soil very well. Dyed Mulch Cons – So where do I begin. I will try not to be too cynical about this. Dyed mulches especially the ones you find packaged in 2 cubic yard bags at the big box stores are nothing more than ground up pallets. The only way for the mulch to have such brilliant color is to use fresh light colored wood. Ground up pallets are perfect for that. But they add no compost because this would throw the color off. 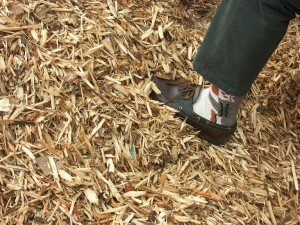 Because of the material used, this mulch does not break down quickly AT ALL. I have dug up mulch a foot down and there are still chunky, shredded pieces of wood mulch that was applied 5 years before. But because it is a dyed material, it still needs to be reapplied at least every other year, and if you want to control your weeds you need to replace it every year. This means that over the course of 5 to 8 years you could potentially add a foot of height to your beds. Why this becomes a problem, is because burying the stems of shrubs and especially trees is eventually fatal to them. In addition to the refusal of dyed mulches to breakdown into soil, you also have the issue of nitrogen. As I mentioned earlier, mulch in the first few weeks if not months draw nitrogen out the soil as it begins the decomposition process. Because dyed mulch takes so long to break down it will be drawing nitrogen for a long time as well. This in turn means you will have to supplement with chemical nitrogen supplements or risk having sickly yellowish plants susceptible to pests and disease. Finally, and this is entirely personal, I hate it. I can’t tell you how much I hate being covered in red dye. I hate how if it happens to rain while applying red dyed mulch especially, it looks like I just slaughtered a goat on the sidewalk. I hate how you can see it from outer space, it’s so bright. And maybe just maybe, because I am an organic, permaculture driven, small business, I hate to put down the same product that every McDonalds has in its landscape. But I digress. We recommend, as the most economical and practical of the mulches we can choose from, ECO mulch. Our supplier calls it ECO while others call it Natural Hardwood, or double ground. What you want to look for is added compost. It does the job of retaining moisture, keeping weeds at bay, and quickly breaking down into useable soil. If you want red color, certain Hemlock mulches are a maroon to red color but not dyed. If you don’t care for the red and want good color retention, pine blend is best. What does Echinacea have to do with Snake Oil?